Before a stallion may be considered for approval his eligibility must be verified by WSI. The stallion must possess a five-generation pedigree with no missing ancestors and no unapproved stallions, and he must descend from a damline that has produced international (FEI) athletes. If a stallion is a Thoroughbred or descends from a Thoroughbred damline the FEI criterion may be disregarded. The viewings for jumping, eventing, and dressage stallions begin in the first quarter of each year with Stage 1 Inspections. Over a period of several weeks the stallions are presented to the Stage 1 Committee, which consists of breeding and sport horse professionals from WSI and KWPN. At the Stage 1 viewing stallions are evaluated for any observable genetic abnormalities or deficiencies, and conformation is assessed. Next, they are judged at the walk and trot on hard ground. This allows the committee to clearly observe any abnormal movement and/or leg stance. Finally, all stallions are judged on their free movement and/or movement under saddle, and jumper and eventing stallions are assessed for their talent free-jumping and/or jumping under saddle. 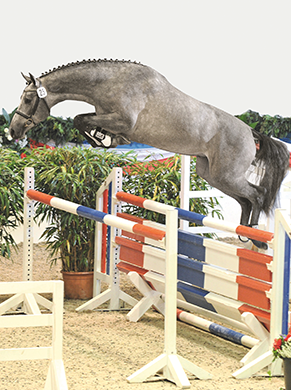 Jumping talent is obviously very important for jumpers and eventers undergoing selection. Observations of these stallions as they jump provide the Stage 1 Committee with important information about a stallion’s attitude and the way he uses his body. Young stallions are loose-jumped in a chute created by setting up a barrier in the ring. The chute, which is parallel to the long side of the ring, contains three jumps: two verticals and an oxer at the end. The jumps are initially set low but are gradually raised. The stallions are brought into the ring individually and calmly directed over the jumps several times. This process allows the Committee to evaluate a stallion’s reflexes, technique, carefulness, and scope. In addition, stallions are judged on the canter in the chute. A similar evaluation is done on stallions jumping under saddle. These stallions jump a course of fences suitable for their age and level of training and development. Dressage stallions are evaluated specifically for carriage, stride length, rhythm and regularity, balance in turns, body use in the trot and canter, and the ease with which they perform flying changes when changing direction. In the free movement evaluation, the selection committee also observes the attitude of each dressage stallion. Because the walk is an important basic gait for a dressage stallion, the Committee places great value on its purity, stride length, and suppleness. Stallions that pass the Stage 1 Inspection are invited to attend the Stage 2 Inspection. An application form for Stage 1 Inspection may be found here.